Women need style, comfort, and support for their feet when they have to deal with tough training hours and exercising for a long time. Definitely, a bulky, heavy and loose fit shoe would not be a helpful option to go on with tough training routine. Keeping in view all the needs women have as an athlete, hiker or a sportswoman, Merrell has provided a wonderful solution for those who need all in one place in the form of a perfect shoe. This is a total pleasure, sturdy and good looking shoe for the women who don’t want to compromise on style and performance at the same time. To get a closer look here are some important features that support their performance and comfort aspects very clearly and with in-depth details. The upper for the shoe is a mixture of breathable fabric and inlays of synthetic material in the form of narrow stripes that increase the flexibility and comfortable fit of the shoe. The toe is guarded by the synthetic rubber giving it a sturdier look protecting the toe from pointy rocks. The overall construction of the upper is made to fit along the foot very easily so that it provides a glove-like fit the foot for an active performance without pressuring the foot. The outsole of the shoe features the Vibram technology that assures flexibility, strong hold on the ground, easy transitioning and a comfortable landing flat on the ground to keep the foot stay stable and comfortable at the same time. The unique design of the outsole offers small-sized partitioning and a supportive construction that matches the natural posture of the foot. These features help in keeping the foot as comfortable and relaxed as possible. The shoe has a unique and well-designed insole as well for keeping the user on the go without causing any hazard. It consists of padded toe-box and heel areas for cradling the toe and the heel comfortably while absorbing the shock and pressure during the gait cycle. This helps in lowered fatigue and increased performance without developing pressure on the muscles. The 8mm cushion and M-select Fresh inner layer for dealing with sweat and gives an odor-resistant feel for hours. The unique odor fighting reactive microbes ensure that there will be no squishy sweat or awful smell with your shoe no matter how long you have worn it during the hiking or practice hours. As stated before, the shoe has a breathable upper that assure continuous air flow towards the inside of the shoe and the M-Select Fresh layer keeps the shoe odorless and sweats free eliminating the chances of getting foot issues and sweat build-up. in this way, the shoe stays dry and offer optimum comfort for the foot. The Vibram sole offers the foot increased grip on any kind of ground surface making it sure you will not slip-off and would be able to walk comfortably. The shoe features 0 mm heel-toe drop and a 13.5, stack for keeping the foot as comfortably flat as possible to support the natural foot posture and lowering the external pressure. To ensure the new users get used to the zero drop construction, it is supported and complemented by the extra cushioning on the heel and toe area. The shoe is lightweight and doesn’t feel heavy on the foot making it sure that you will feel like a glove on your foot rather than a bulky padded shoe. This keeps the fatigue level to the least and keeps the users active and easy no matter how much they have to walk, hike or play. It's around 11 oz which is too light to be true for such a sturdy and you may not find this much ease most of the other trail running shoes. With the help of consistent and well-structured padding on the inside and support from the outside, the shoe offers snug yet comfortable fitting for the foot to keep it easy and safe from slipping and reduces pressure as well. The shoe is extremely easy to clean up as you can easily wash it in cold water in your washing machine causing no harm to its components. You may use the gentle cycle and air dry for the best results. The shoe stays in shape for a long time without frequent wear and tear. • A sturdy and long-lasting shoe that provides comfort and enhances performance with its unique supportive and comfort features that reduce fatigue and pressure. 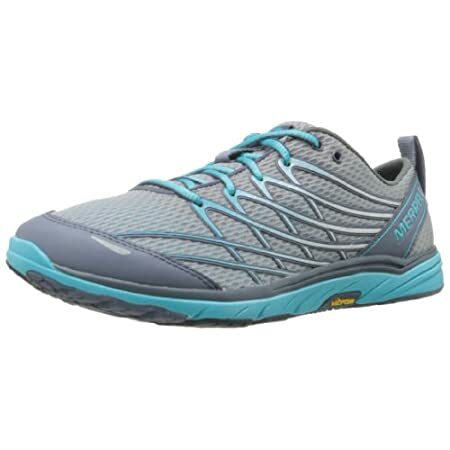 • Lightweight construction assures lower weight hence keep the foot easy. • The low-drop sole keep the foot in its natural form for easier gait cycle while support heel and toe areas in an active way. • Sweat-free and odor-resistant inner lining for added comfort. • Can serve to perform multiple tasks where your foot needs comfort, support, and an active boost while lowering the pressure on the muscles like in hiking, running or trail walking. • In contrast to its low-drop construction, the arc is not a low one. Customers have rated the shoe as a 4.4-star shoe out of 5 stars which reflects its worth and performance level for most of the hiking, trailing and running tasks. Finally, we can conclude that this Merrell woman Bare Access Arc 3 trail running shoe is a good one for the daily users and may give the best performance features the users may need. Though it may not feel as barefoot as it claims to be still having the cushioning on the inner side and the low drop construction assure the foot stays in its best posture for least pressure and reduced fatigue factor. It surely is worthy enough for those who need quality and comfort.